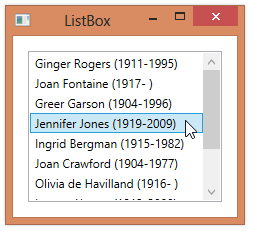 By default, a user can select one item at a time in a ListBox. 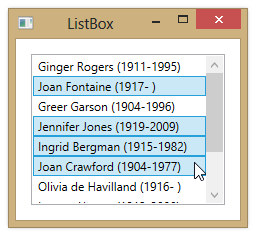 You can use the SelectionMode property of the ListBox to allow the user to select multiple items. By default, the SelectionMode property has a value of SelectionMode.Single, allowing the user to select a single item. Control + left-click selects/unselects an additional item. Previously selected items remain selected. Shift + left-click selects all items between the most recently selected item and the one being clicked (inclusive). Previously selected items not in this range are unselected.